Homeopathic treatment of uterine fibroids can be very effectual and is highly recommended, often the only treatment required especially when treated early when the fibroids are of small to medium size. Fibroids are tumors of the muscle lining the wall of the uterus (womb). They are therefore also known as "myoma" or muscle tumors. Fibroids are almost always benign (not cancerous) and can be solitary or multiple. They vary is size and only in unusual cases become very large. Fibroids are most common in women between ages 40-50 years and may be dormant without any symptoms or may cause excessive bleeding and pressure symptoms leading to frequent urination and rectal pressure. Submucosal fibroids which grow into the uterine cavity. Intramural fibroids which grow within the wall of the uterus. Subserosal fibroids which grow on the outside of the uterus. Should I opt for homeopathic medicines if I have fibroids? Yes, you definitely should provided the fibroids are small to medium size, irrespective of their number. The location too plays an important role and fibroids which are within the uterine cavity (submucousal) and within the uterine wall (Intramural) are easier to treat. Intramural (within the wall) fibroids can be reduced in size and cannot be expunged or dissected naturally like those in the uterine cavity (submucousal). You can refer to a case of Intramural fibroid (withing the wall of the uterus) cured using our medicines within 5-6 months. Since we started the treatment early the results were fast. we therefore urge patients to consider this treatment as early as possible as uterine fibroid tend to increase in size and number if not treated early. Large fibroids are those which take up more than 3x3 cm as per our clinical guidelines and not as per standard medical books. Fibroids which are larger than this take longer and the outcome a bit uncertain. Said that larger fibroids have been treated successfully too; however the time duration is comparatively longer. 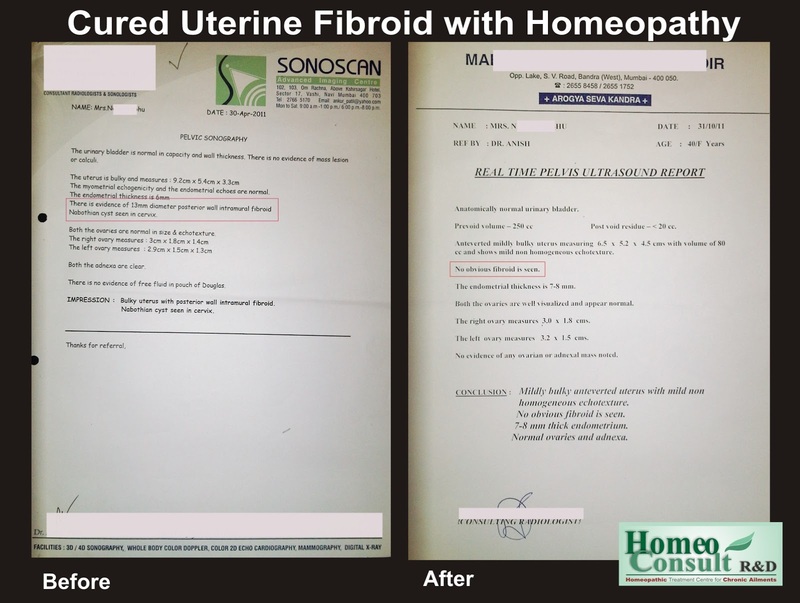 How do homeopathic medicines for fibroids work? a. Reducing or cutting the blood flow to the tumor. This is evident by the reduced bleeding or hemorrhage experienced by women on starting homeopathic medicines at our clinics. c. The fibroid usually shrinks in size over a few months. You may also experience pieces of the amputated fibroid being expelled out usually during your menstrual cycle. 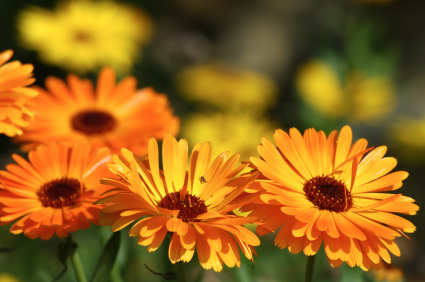 Which homeopathic remedy do we recommend for treating fibroids? There is no one single remedy which is a traditional fibroid remedy. A constitutional remedy based on the totality of all your symptoms is an ideal prescription. Some well-indicated remedies used at our centres are: Calcarea Carbonica, Thuja Occidentalis, Lachesis Mutans, Phosphorus, Aurum Mur Natrionatum, Fraxinus Americanus, Silicea etc, to name a few. Never indulge into self medication as the remedy indicated in your case depends on the signs and symptoms you present with and could be entirely different. We at HomeoConsult RD strongly recommend anyone with this condition to first try homeopathy as the treatment outcome is very favorable and surgery avoidable when treated timely.